This beautiful grey and red bird is a palm cockatoo or black palm cockatoo. While I absolutely adore vintage bookplate images like this one, the artist sadly did not really come close to showing the stunning colors of this bird. His grey feathers are more similar to graphite than this muddied color. His face plate is bright red, not the sort of faded pink that this parrot drawing has. Why include such a drawing among the bird drawings here on Reusable Art? Well, it is still stunning, even if it is not 100% accurate. Consider too that many of the natural history volumes written in the 1800s expected artists to be able to draw animals and plants based only upon written descriptions by naturalists. Sometimes they are stunningly correct in their recreations and other times they miss the mark a bit. 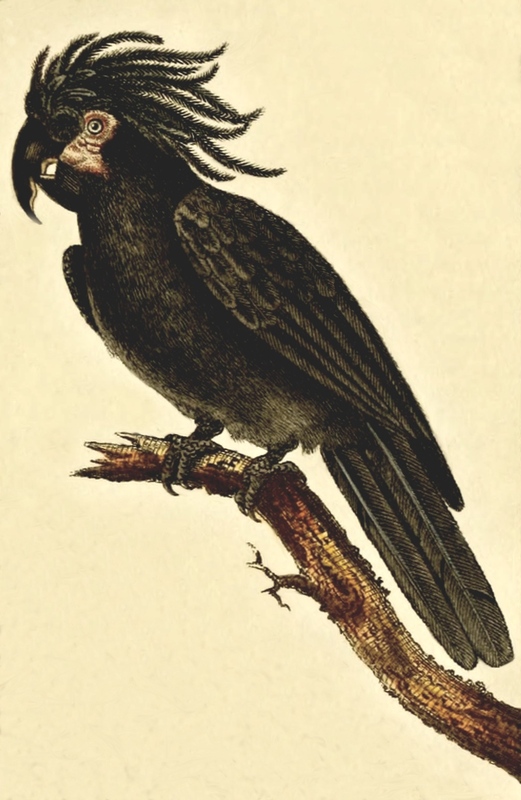 This palm cockatoo drawing is from 1822 when it was included as part of a multi-volume dictionary written by Jean Baptiste Geneviève Marcellin (1778-1846). It is one of a number of book plate-sized colored drawings form the work that I have included here on Reusable Art.